First! 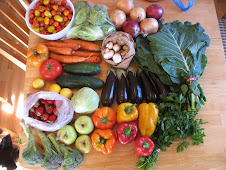 An important reminder that tomorrow is the drawing for my Vegan Trader Joe's Giveaway! So enter now if you want to be a part of it! Last night I made Kaji's Mom's Tomato and Cauliflower Soup. I liked it pretty well, but Musty was crazy about it. I was able to predict this because he LOVES: tomato soup, cauliflower, any thing with cinnamon in it. It was a combination he could not refuse. 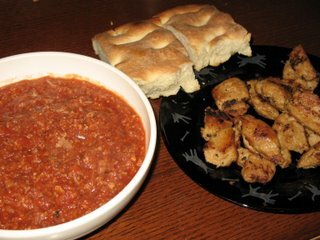 With the soup, we had some sauteed seitan nuggets (Musty says "Just call me Seitanic!") and also some focaccia from the farmer's market. Yum... thanks for the recipe Kaji's Mom! 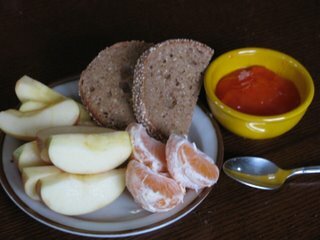 This morning for breakfast I had a couple little pieces of whole wheat toast, a satsuma mandarin, an apple, and a perfectly ripe persimmon -mushed into a bowl and ready to eat. I am working on cultivating a taste for persimmons, and it is coming along nicely! Tonight for dinner I made a big mess of delicious roasted winter veggies: Butternut Squash, Baby potatoes, beets, and a giant rutabega. I tossed them with a little olive oil, a bunch of crushed garlic cloves and a small handful of chopped oregano, rosemary, and thyme from our garden. Cooked 'em at 400 for 45, stirring every 15 min. So good that Musty and I practically fell in love all over again at the dinner table... we couldn't stop swooning over how tasty it all was! 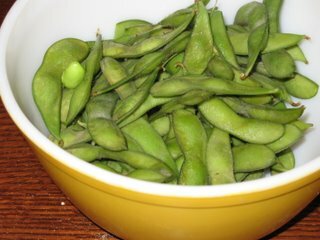 I also served a nice bowl of edamame with din. 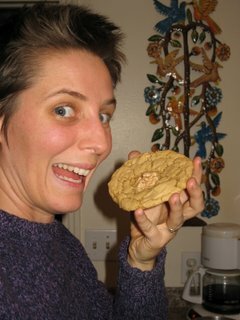 Then tonight, I made two batches of cookies... both from Vive Le Vegan. First, I made the Kamut-Hemp Chews. I didn't have kamut flour, so I used spelt. They turned out pretty yummy... maybe not quite sweet or moist enough for my preferences... but still worth eating. Secondly, I made the real star of the show - Maple Walnut Cookies. YUM ALERT!! These cookies are so insanely good I can't hardly stand it! They are also really quick and easy. If you have Dreena's great book, I highly highly recommend that you go make these. I took this picture so that you can see how big and delicious they are! I thought about trying that soup. I love cauliflower but not cooked tomato. It sure looks and sounds good though. Aphrodisiac veggies, huh? They are beautiful! And so are the cookies! I'm going to go look at the recipe right now! Glad you liked the soup and that the recipe worked out well for you! I'm always nervous that for some reason my recipes won't work for other people. Yeah, that soup is nice... but maybe not if you're not into cooked tomatoes - it's quite tomato-y! I definitely recommend the cookies!! We really liked the soup... don't worry! :) Thanks for sharing. I'm always amazed by people like you who actually create recipes, which I never do. Roasted veggies are my fav! I'm sad that all my fresh herbs are dead (the weather froze them). I think I'd like to try to grow some indoors. I really miss fresh rosemary the most! 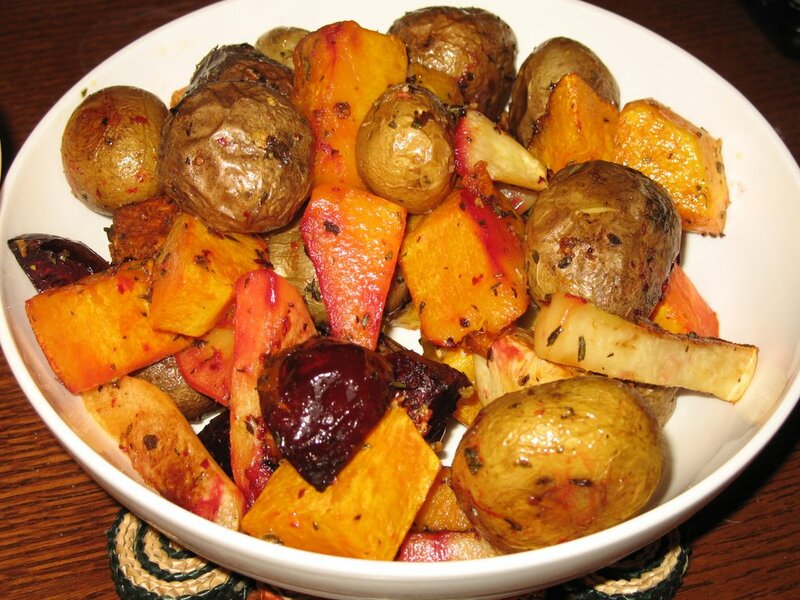 Nothing enhances the flavor of roasted veggies like rosemary. Haven't made those cookies but I think I will now. Thanks for the review.